2YourFace by 2YourFace.com - Boost Your PC. 2YourFace is a chat and video sharing program that works with Facebook. 2YourFace installes a web browser extension such as a Browser Helper Object in Internet Explore. This extension is used to provide third party advertising within the user's web browser. 2YourFace is typically included with bundled software installers. Download Boost and enjoy your PC. Remove 2YourFace from your PC. Why should I uninstall 2YourFace? 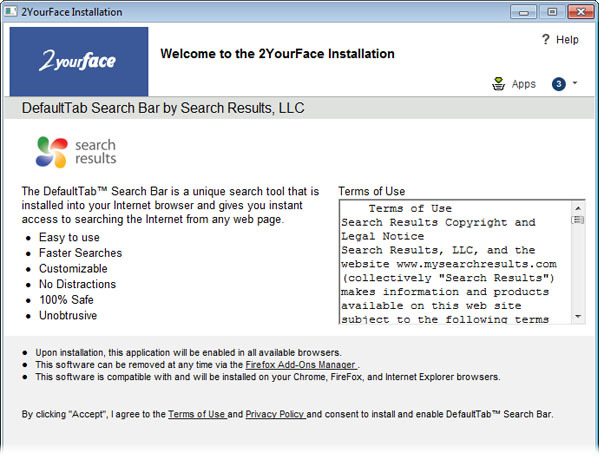 2YourFace is ad-supported with a bundled installer that includes various adware type applications such as the Search-Results.com toolbar as well as others. 2YourFace also displays advertisements in the user's web browser through an always on web browser extension. To the right of the list item, click the Uninstall button and Boost will completely remove 2YourFace from your PC. Use Add/Remove Programs control panel in Windows makes to uninstall 2YourFace. Follow the appropriate instructions below to use this control panel. Select 2YourFace from the list of programs, and click Uninstall. Alternatively, right-click the program and select Uninstall. Select 2YourFace from the program list, and click Uninstall. Alternatively, right-click the program and select Uninstall. Select 2YourFace from the list of programs and click Remove. Boost helps you remove 2YourFace and clean your PC.